Industrial quality electrically insulated glassfibre steps with aluminium treads. BS EN131, 150kg rating for industrial use. Tool holder set in top. Non-conductive steps at an economical price, suitable for use near electric cables etc. Heavy duty glass fibre swing back steps are great for industrial use due to their non-conductive nature. Our heavy duty kite marked glass fibre swing back steps are non-conductive at an economical price and are suitable for use near electric cables etc. ensuring the safety of the person using the equipment. 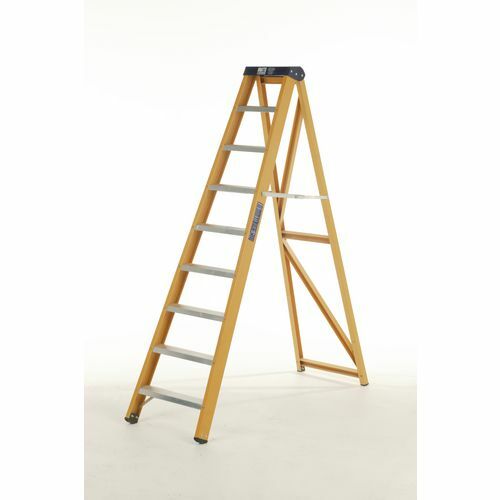 These ladders comply with BS EN131, the Electricity Boards Standards ESI 13-1 and ANSI 14-5, so you can be confident when using these ladders. 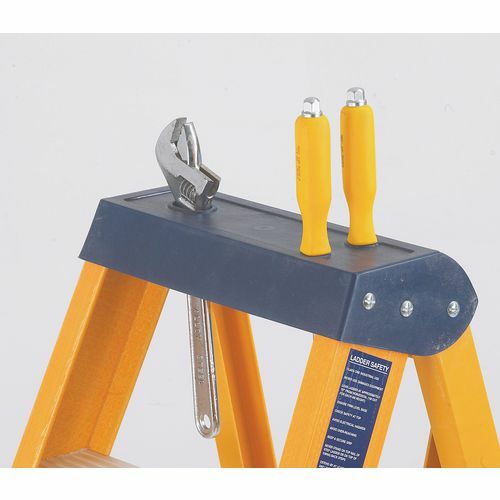 There is a tool holder set in the top of these steps allowing you to work safely with your tools always at hand to complete the tasks you are doing. 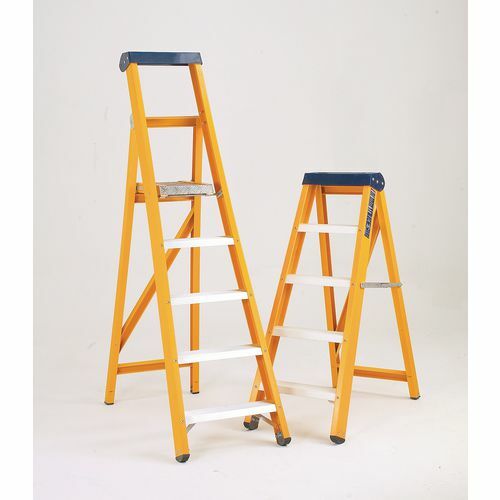 The slip-resistant rubber feet add to the stability of the product, allowing you to safely work on difficult surfaces, while the 85mm deep serrated treads add extra grip for the users feet making them feel more secure going up or down the steps. Our product is available in seven heights measured in the number of treads including the platform; 4, 5, 6, 7, 8, 9 and 10. They a have 12 month guarantee and FREE UK Delivery.